Whether you are pulling out extra seating for holiday guests, putting away patio furniture for the season, or simply cleaning your dog’s crate, it wouldn’t hurt to arm yourself with a dependable cleanser that is kind to your senses and the environment. We have two resin yard chairs that are about ten years old. 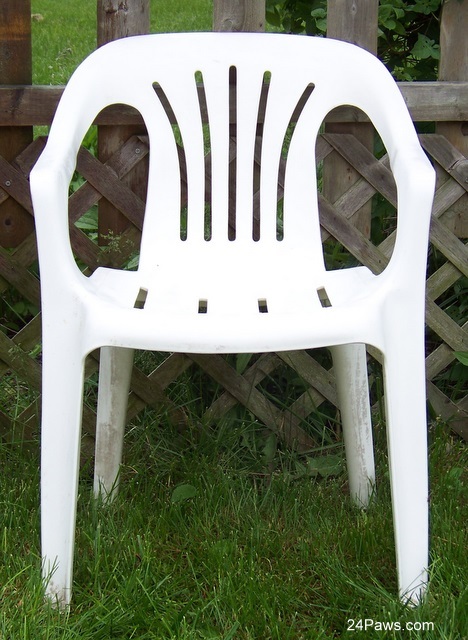 They have lost the “shiny” protective layer that made the chair slick and easily maintainable. When the resin loses this layer, anything and everything sticks to it, and it no longer offers an inviting seat. The entire chair looked like the left half in the photo below. 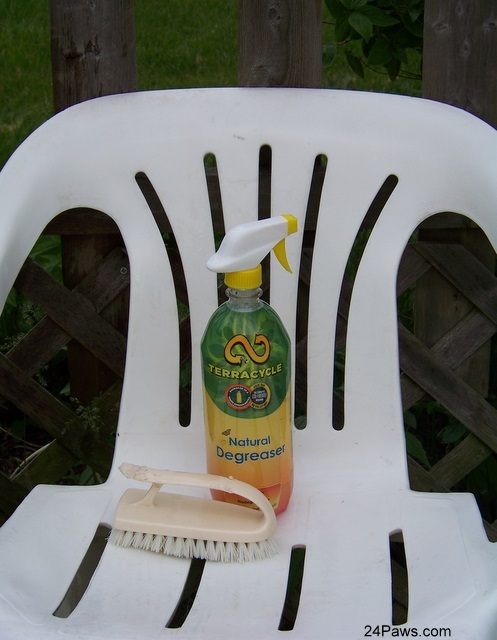 I’ve tried a number of cleansers on this chair. I’ve hauled it into the bathroom to let it “soak” in a bleach based cleanser, I’ve used two-part cleansers that apparently only pitted the chair and finished off any remaining protective coating that may have existed. One beautiful summer day I headed outside with the degreaser spray (in my non-gloved hands) and scrubbed the chair with a once-coveted scrub brush by a much younger Tristan. 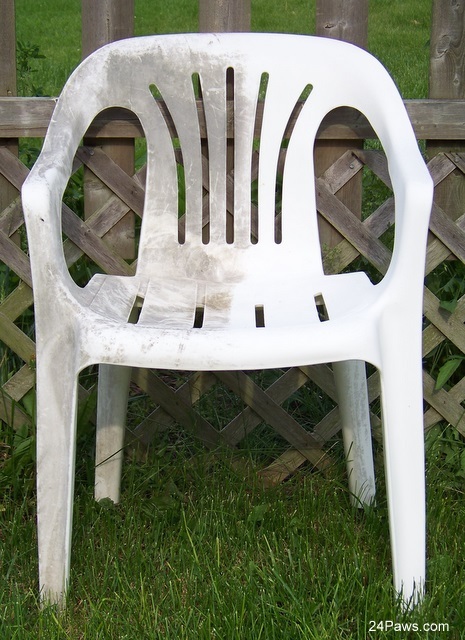 I gave the chair a quick rinse with the garden hose, and I proudly present to you a CLEAN chair. Well, I jumped ahead of myself with this photo, as I later realized I forgot the back legs, but they were cleaned too, have no fear. I didn’t have to tarp my yard or worry about run-off into the flower bed. This cleanser attacked the grime on my chair, not the living grass beneath it. No flowers or grass were harmed in the cleaning of this chair. Oh yeah, neither were the humans or non-human animals of the house or yard. Although this looks like a lot of scrubbing, the degreaser did most of the work, thus preventing me from tearing my rotator cuff for the fourth time. I mentioned it earlier, but I highly recommend this product for degreasing your pet’s crates, carriers, and dog houses, whether they be plastic or metal. 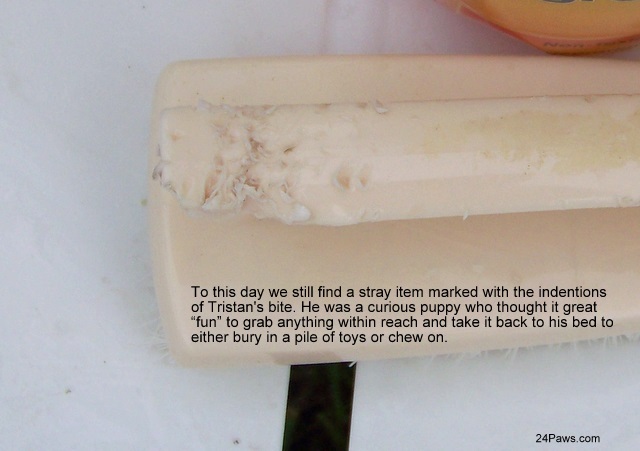 You may or may not have noticed that the inside of your dog’s crate can acquire a very unattractive and “greasy” surface that is discolored and smelly. This coating is created by your pet rubbing and lying against the surface of the crate. The natural oils from his coat transfer to the surface and begin to retain all odors and hair. This may, if left long enough, begin to discolor the surface. Establishing a regular cleaning routine of these items will help keep your pet healthy and your home free of any odd odors you can’t seem to locate. Pack / Nature Approval: We’ve been using TerraCycle Natural Degreaser for over a year, and none of the 24Paws Pack suffered any negative responses. Tristan, Mr. Sensitive Nose & Skin, never sneezed or presented with any allergic reactions when he was in the room or area where the spray was being applied. When we’ve applied the cleanser outside, there were no visible traces of our use – no dead grass, flowers, or any other living element. Human Response: As someone with both asthma and extremely fair and sensitive skin, I’ve neither had a reaction to the solution when it has had contact with my skin, nor has it induced an asthma attack. How’d We Get our Paws On It? TerraCycle sent it to us. Easily portable: Yes. Willing to clean wherever the desire takes you. Why we like it: Non-toxic, No Fragrances or Dyes, Biodegradable, pet and people friendly/safe ingredients, is an effective cleaner without being harsh, is NOT tested on animals, contains no animal-derived products, packaged in a waste stream recyclable bottle, is absent of ammonia, phosphate and petroleum ingredients. This non-abrasive cleanser does the job without walking away with peeling/burning skin or a diminished product. Water, grease cutters and performance enhancers (linear alcohol ethoxylates), essential oil cleaners and soaps, all derived from natural sources.